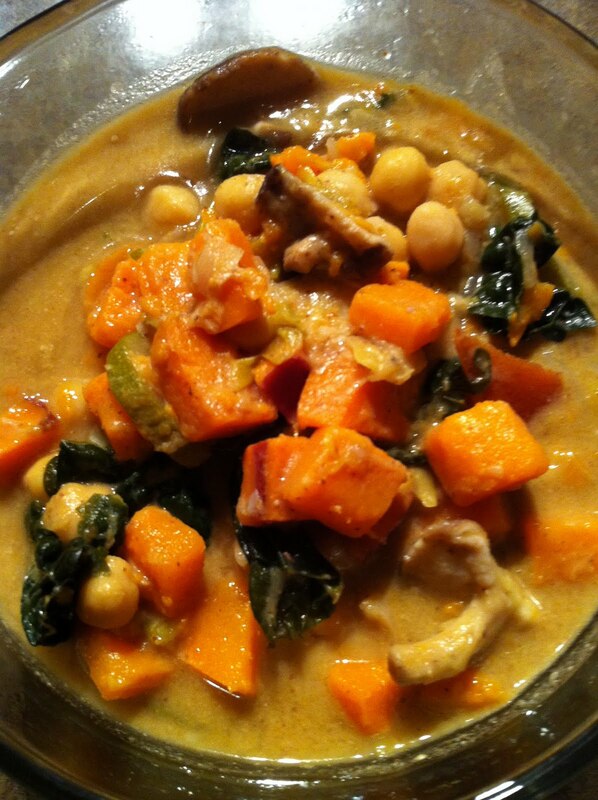 Nurture Your Health: New and Improved Chickpea Stew! There have been many chickpea stews on this blog/in my recipe handouts/in my old newsletters, but this feels like the chickpea stew to be reckoned with! Place oil in soup pot and heat to low-medium. Add onion, garlic, and leek and saute for 3 minutes. Add mushrooms, zucchini, and carrot and saute for 5 minutes (add a few tbsp of water if necessary). Add ginger, cumin, cayenne, and sea salt and saute for 1 minute. Add yams and stir well. Add almond butter and use whisk/fork to mix thoroughly. Add water, bring to boil, reduce to simmer for 30 minutes. Remove from heat, add chickpeas and black kale. Serve over long grain brown rice. This chickpea stew was rich and very delicious - definitely recommended as a filling, warming winter meal!